UMP | University of Minnesota Press Blog: Laurie Hertzel series, Part 4: When I Was ... 30 and stumbled upon the biggest story of my life. Laurie Hertzel series, Part 4: When I Was ... 30 and stumbled upon the biggest story of my life. The year I turned 30 I stumbled across the story of a lifetime. The newspaper sent me to the Soviet Union for two weeks to cover the expedition of a group of 33 Duluthians who wanted to establish a sister-city friendship with the Russian city of Petrozavodsk. Once there, we met a whole community of ex-pats, people who had been born in northern Minnesota and Wisconsin and had been brought, as children, to the U.S.S.R. in the 1930s with their parents, idealistic Socialist Finns. Most of their fathers had been lost to Stalin’s purges, and these transplanted American Finns had had a hard life, but through intelligence and resourcefulness they had flourished. It was an amazing story, and a few years later I went back alone for a month to interview these people at length for a book. The summer of 1991 I spent two weeks in Finland, doing research at the Institute of Migration Studies in Turku, before taking the train to Russia (where I would stay for two more weeks). I had two days in Leningrad before taking the overnight train to Petrozavodsk, and I was extremely homesick. I couldn’t speak or read the language, and I spent the two days wandering around the city on foot, afraid to stray too far from familiar places because if I got lost I was doomed. Neva River in northwestern Russia. 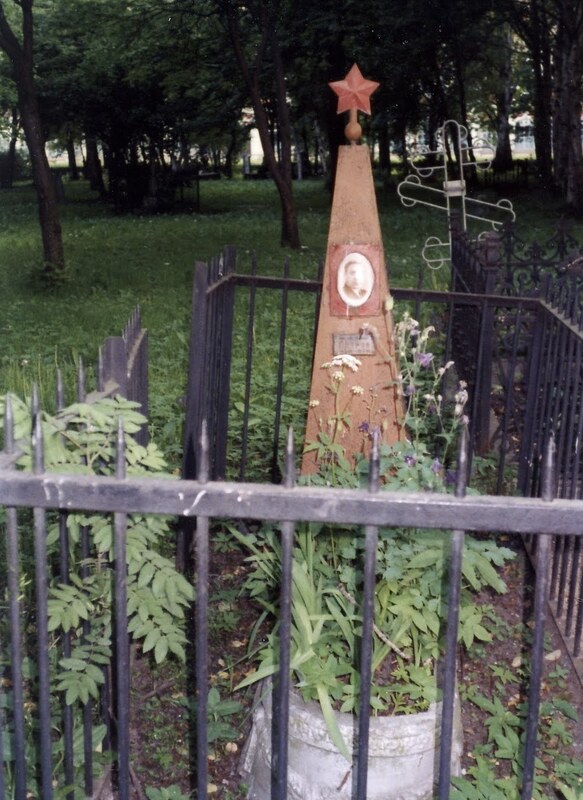 That second afternoon I found myself along the Neva River, in a park with a graveyard at one end. I had been walking for hours, I was tired, I hadn't been home in a long time, and I missed my dog. I was feeling lonely and immensely sorry for myself. The graves were mostly of heroes of what the Russians call the Great Patriotic War and we call World War II. The markers had faces engraved on them, the faces of handsome young soldiers, and red stars. The graves looked well-tended, and they made me feel even sadder. After a while, I sat down on a bench. The thought of spending another two weeks away from home felt overwhelming. I had no one to talk to. I couldn’t even read a newspaper. Up the path came two stout women in headscarves. They had dogs with them — dogs that lay politely at their feet as the women sat down nearby and began to chat. I decided to walk over and, using sign language and the only Russian phrase I knew (Без перевода, which means "excuse me,"), make it clear I wanted to pet the dogs. Maybe I could play with them — toss a tennis ball, watch them run. I missed my Toby so much. I thought about it for awhile, and then I got up and started over. “Без перевода," I said. The women looked up, startled. They were wearing cotton aprons over flowered dresses, and one of them held a large walking stick. Up close, the dogs no longer looked appealing. Their eyes were red, and one of them had a badly torn ear. At my approach, they leaped up and barked. The woman gave them a sharp hit with her stick and yelled. The dogs lay down again, but watched me, growling ominously. The women turned to me and let loose a stream of Russian words. I have no idea what they were saying; Russian is a harsh-sounding language, and to me it sounded as though they were yelling. "Без перевода," I said again, and walked back to my bench. I sat down and stared out at the late June afternoon, and foolish tears rolled down my cheeks. I had a 12-hour train ride ahead of me to Petrozavodsk, and two more weeks before I would be home. This one made me a bit sad. No stranger to your feelings of homesick and lonely, Laurie. Had the same in Ukraine--especially that fear of venturing too far from my lodging. Wouldn't trade these experiences for the world though. How about you? it's a little sad, yes, but extended travel can be lonely. the trip picked up again once i got to petrozavodsk and got busy interviewing people.